One of the things we have lost in our modern culture is the teaching of fiber arts to our children (unless you adhere to Waldorf philosophy). Traditionally, mothers and grandmothers taught children to weave, sew, and knit. I had to go to college to learn how to weave! I was so excited when my sister bought this Leave It To Weaver Kit from Land of Nod. A similar loom is available through Amazon. This frame loom is of high quality and works well, unlike many other looms I have seen designed for children that are frustrating to use. The right tool is important for good results! The only draw back to this loom is the yarn it comes with is acrylic; however, it is very nice yarn and future projects can be made with natural fiber yarn. The loom is rated for ages 7 and up, but my 5.5 year old daughter has no problem weaving on the wooden loom. 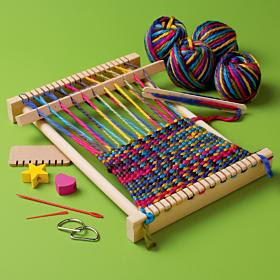 Weaving, as well as finger knitting, is a great activities for fine motor development. I assume that children are not teached to sew etc. in schools there? I’m not really aware of USA’s school system, but at least in Finland all children have to go to school in age of seven and they end it when they are 16 or 17. Around age 8 we start art-, music, wood craft and sewing lessons and we must study them at least four years, but most will continue studying them next 9 years, because they are nice studies when comparing to maths etc. In my experience, children are not taught these skills in school. As a teacher, we did make a few quilts with volunteers, and I taught spinning, but these are enrichment activities and not part of the curriculum. Many parents seek out Waldorf schools so that their children will learn these skills. What a wonderful loom! I hope to get one for my little one’s soon. I’ve already been teaching my oldest a little bit of sewing and knitting (he’s five) and my other two older ones’ (2 & 3) are learning hand knitting. I’m also teaching them how to use a drop spindle. James especially enjoys being able to use the thread he himself spun (even if it is lump). I didn’t learn knitting until a year and a half ago when I taught myself. My mother tried teaching me to crochet growing up but it just never stuck although she did succeed in teaching me how to sew and embroider. I was looking forward to home-ec when I got old enough only to find out that my school district no longer offered that class. Bleh. My husband learned how to use a sewing machine before I did! His school district requires all students to take home ec, which in my opinion is very good. We live in the same area, and I only hope it’s still offered when my children are old enough to go (if we don’t homeschool them).